After a pompous entrance to the boxing ring, Floyd Mayweather Jr. went all the way and stayed undefeated with an immaculate 46-0 win-loss record after defeating Marcos Maidana via majority decision. The score cards revealed that judge Michael Pernick had it all even at 114-114, but his verdict was overruled by the 117-111 and 116-111 scoring of Burt Clements and Dave Moretti who had it for Floyd. It was a hard-earned victory for Mayweather as he survived a scare in this match. 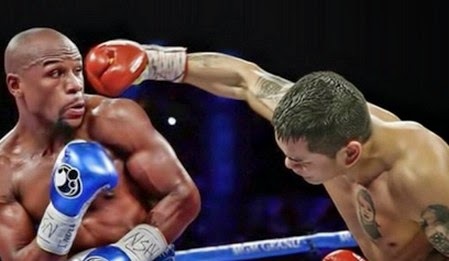 Maidana attacked and chased him right from the 1st round up to the last round. Maidana's tactics forced the undefeated Mayweather to change his "box and move" fighting style resulting to a very tough physical fight. Their fiery exchange of punches entertained the crowd inside the venue as if they haven't seen a fight like this coming from Floyd for a very long time. As the fight intensifies in the latter rounds, Floyd was able to catch Maidana more cleanly on the head and body leading to a 230-221 advantage in terms of the final tally of the number of punches that landed successfully.